The MX-5 Miata is an iconic lightweight two-seat convertible roadster, featuring a front-engine and rear-wheel drive layout. The philosophy of the unique little roadster comes from small British and Italian roadsters from the 1960s but features modern technology. 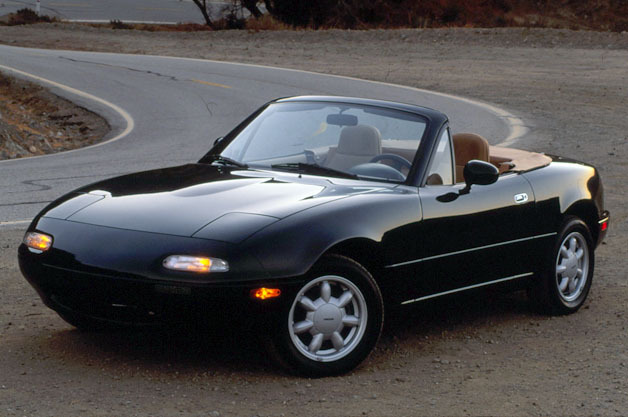 The MX-5 Miata debuted in 1989 at the Chicago Auto Show. The first-generation (the NA) MX-5 Miata sold over 400,000 units from 1989 to 1997, and was recognizable by its pop-up headlights. The second generation (the NB) was introduced at the Tokyo Motor Show in 1997 as a 1998 model year. The newer generation introduced fixed headlights; a new, glass rear window; and additional engine power. The third-generation MX-5 Miata (the NC) was introduced as a 2006 model year. While the exterior styling resembles the second-generation MX-5 Miata, other than the side-panel turning-lights, the cars share no components. The third-generation Miata features up-to-date technology and safety elements, and is available in both a hard- and soft-top. The Miata continues to be the best-selling two-seat convertible sports car in history, and a redesigned MX-5 Miata is on the way for the 2015 model year – rumored to be the edgiest MX-5 Miata yet. Only time will tell! Wheels Magazine’s Car of the Year for 1989 and 2005. 2005–2006 Car of the Year Japan. 2005 Australian Car of the Year. Car and Driver magazine’s annual Ten Best list 14 times. Grassroots Motorsports magazine named the Miata as the most important sports car built during the previous 25 years.